And let’s say, that when I say good morning, the room is silent. No one says a word to me. How do you think I’d feel, if I opened with a high energy greeting, and not one person said a word? I’d feel awkward. Embarrassed. I’d probably be thinking, this is not going to go well. Whatever I’m thinking, or feeling, it’s negative, right? And my next response would be dictated by the negative feelings in my head. I might not be my best as a trainer, because I’m a little embarrassed, and feeling rejected. If most of the people in my live audience, in my example, said back to me, Good morning, the chain would have been linked; I wouldn’t have felt rejected, and all would’ve been well. When the link is broken, people can feel rejected, slighted, or angry. – You don’t want your customer to feel any of these emotions. Avoid negative feelings by linking the communication chain. You link the chain by acknowledging whatever your customers put out there. Do you find it difficult to get customers to accept your word as final? Like, do they just come back and ask their question another way. Or even better, do they ask to talk to your manager? The thing is, we all need to get better at making our answer the final answer. It’s pretty easy to give a firm answer when you have the right approach. Making your answer the final answer comes down to two things. You must be assertive, and you must be direct. I talk about how to make your answer the definitive solution in the short video below. In the video I made for you, I share an example one of my clients shared with me. He worked on the escalation team for a Timeshare company. He had to talk to customers who were ready to get rid of their timeshare for one reason or another but were told they couldn’t unload that mortgage because the contract was for life. It lived on even after the owner died. I have a module dedicated to how to make your word the definitive answer in my De-escalation Online Course, which is part of my Customer Service eLearning suite. If you or your employees struggle at all with how to get challenging customers to back down, take a look at my De-escalation Training Course. I share my client’s approach to getting his timeshare customers to accept his no as the final answer every single time. Hint: He did it by being assertive and direct. Watch my video to learn how to get your customers to accept your word as final. So, again, if you or your employees struggle at all with how to get challenging customers to back down, take a look at my De-escalation Training Course. I Had to Pull the “Get Me a Manager” Card. Here’s Why. I’ve told this story on my blog before, so bear with me if you’ve already heard it. I’m standing at the front desk of a nice hotel in Baltimore. The front desk clerk is having a problem with my reservation. I wondered if it was because I had literally just booked the reservation 45 minutes prior, just as I got into my rental car at the airport. I told the hotel employee that perhaps my very recent booking was the problem. The primary reason I use hotels.com is for the rewards. I travel a lot. It takes ten hotel stays to earn a free hotel night. In June I earned two free hotel nights and used both of those nights for get-aways with my husband. I travel a lot. Now, the hotels.com call center is telling me that because they couldn’t help my hotel in Baltimore sort out a problem, they are removing my earned rewards? Pretty quickly in the interaction, I asked to speak to a manager. Here’s why I felt I needed to do this. 1. The number one thing customers want is help. When you don’t/can’t help, customers instinctively want to climb the ladder. 2. Customers also want acknowledgment. Another way to think of this is empathy. Without acknowledgment/empathy, it sounds like you don’t care. And if you don’t care, they might as well speak to someone else. My daughter and I were driving home from church Sunday afternoon. We were in the left hand turn lane behind another car. We had the green arrow, yet the car in front of me hadn’t started to accelerate. The driver behind me laid on the horn something terrible. I actually turned around to look at her. She let up for a second and then honked again. “Ridiculous,” I said to my daughter. In the rearview mirror I saw the lady was giving me the middle finger, all because she assumed I was the holdup at the light. About the time I got flipped off, the driver in front of me turned left and I followed. The honking profane driver quickly accelerated and then drove side -by-side me. What? Then she literally drove into my lane, nearly hitting me! I found myself getting heated and frankly, I wanted to cuss. But my daughter was in the car and I had to ensure her safety, as well as my own. So, I had to de-escalate the situation. In my peripheral I could see the lady gesturing at me still. I avoided eye contact, didn’t return the bird gesture and I didn’t even utter words that the driver wouldn’t hear anyway. I slowed down just a bit so that she had to pass me. And then, it was over. My mistake in this situation was physically turning around and looking at the driver. That enticed the driver to continue and become more aggressive. Fortunately, I’m skilled in de-escalation because I teach de-escalation in my Verbal Aikido training sessions. The moment I realized my error, I moved into de-escalation. My de-escalation tactic in this situation was to avoid eye contact, so not to appear threatening or aggressive, and to choose silence as opposed to profanity. I let it go and the out of control driver was defused, or at least, the situation for me and my daughter was calm. De-escalation is a strategic tool that your employees can use when they find themselves in a ridiculous situation with an agitated, angry or out of control customer. Not unlike what I experienced in traffic 2 days ago. No matter what your product or service is or what business you’re in, your employees will have to deal with difficult customers. Very few people in customer service actually get the training they need to get an angry customer to back down, regain control and gracefully respond to the customer who demands to speak to a supervisor. 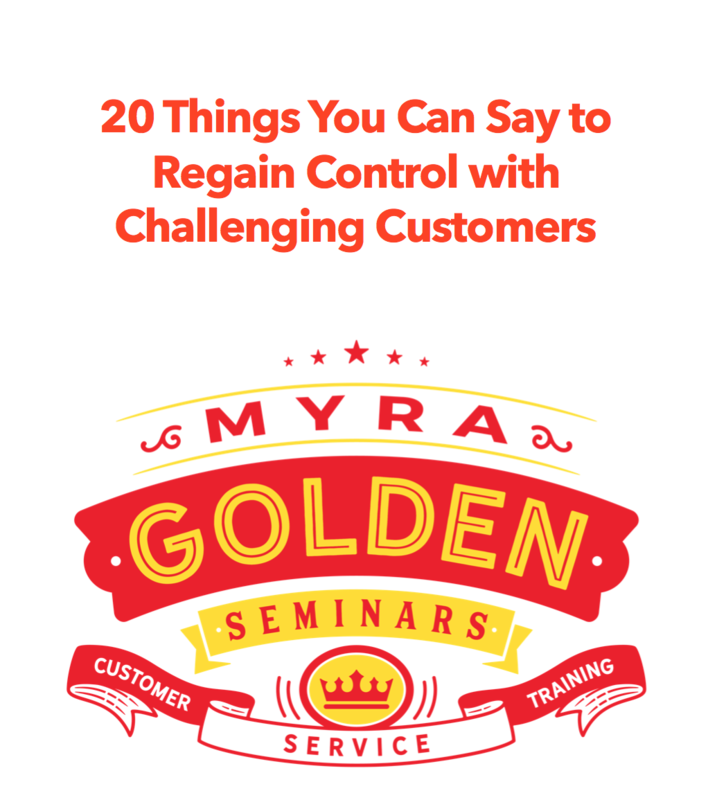 So that’s why I’m sharing these tactics… to show you a fast and easy new way your employees can create calm and regain control with difficult customers.